Edmund Haworth Holden was appointed head of science at Bacup and Rawtenstall Grammar School on its opening in 1913. He was a Manchester graduate and had previously taught in Wigan and Workington. He was also the head of the evening school and became headmaster in 1921 on the retirement of Mr Jackson - of whom more later in the year. His first love was chemistry, which was compulsory to school certificate level. Eileen Taylor (a later Springhill resident) recalls her being called into his office to receive otherwise excellent school cert results only to be greeted with ‘you have FAILED in chemistry’. He had a reputation for hard work, high standards and not suffering fools, but was described as ‘not a caning man’. He used to wear his glasses perched on his forehead giving him an appearance of ‘a cobra about to pounce’. He is said to have habitually dressed in black coat, striped trousers and wing collar. He lived in Lawn House in the early 1920s just after the subdivision of Springhill House and is understood to have continued to live there until 1934 after which Lawn House was subdivided to the current Lawn House and Sunset View. Their billiard room is now The Bungalow but then was used to entertain select boys from the school in table tennis. He retired in 1948 and died in February 1958 having spent his retirement in Wimbledon. In 2001 his daughter Barbara returned to visit Lawn House, her childhood home, and kindly sent some pictures of the house in the 1920s. Edmund Haworth Holden b q1 1883 Bolton 8c 417 s of Robert Percy Pilkington Holden and Sarah Ann nee Haworth. Andrew Hindley was born in April 1956 and brought up in Lytham St Annes. He was educated at Rossall School and Trinity College, Bristol, where he trained for the Baptist ministry. He had two younger brothers, Mark and Michael. In 1979 he was appointed minister of Sion Baptist Chapel where he stayed for six years before moving to Brockley Baptist Church, S London, in 1986. After a period of ministry there he worked for a while in a retreat centre on Lindisfarne. His passion was to help people understand faith and the Bible better. He explored the option of lecturing in Bible college but decided instead to train as a secondary school teacher which he did at Lancaster University. He taught RE at St Wilfred’s, Blackburn, from 2000-2006. It is alleged he performed a version of the Troggs’ ‘Wild Thing’ at a school talent show. He certainly was an expert in 1960s-70 pop trivia and therefore a useful person on a Trivial Pursuits team. As minister of Sion he oversaw the transformation of the ‘old’ C19 chapel from a poorly maintained building (the congregation meeting in the schoolroom) to a set of flats which have been in demand since. Stone from the old chapel was reused in the flats and the complex was named ‘Litchford House’ after a Robert Litchford who donated land and property to the church in 1705. This was in the face of opposition from a local history group who were vocal in wanting the old building retained but less willing to pay for its upkeep when it was not in use for worship - a common problem in heritage and one with no easy answer. Sadly Andrew died on 23 December 2006 aged 50. He conducted my baptism and my wedding. Three weeks before the election and there is one poster in the Springhill area. 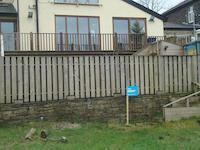 Only one problem, it is on council land outside the house of a rival candidate! The joke is that Clive, the homeowner, chaired the selection committee for the conservative candidate on the poster then didn’t vote for him before jumping ship. He has put that in the public domain. It is strongly suspected to be the work of a certain section of the Rugby club, which he helps to manage. William Heaton of Clough is listed as being one of the 5 tenants of Deadwenclough in 1609, holding land with a copyhold rent of £1 6s 9d. The others were John Nuttall of Newhall Hey, Francis Bridge, John Nuttall of Clough (church land) and Alexander Haworth. Interesting that the church had land in the Cloughfold area so early, they remained a local landowner well into the C19. He was Greave of Rossendale in 1600. His son John was baptised 28 Sept 1640. His will refers to son Richard and daughter Dorothy Pilling but their baptisms are not in the Lancs OPC transcript of Newchurch church. He was buried on 21 Dec 1654. His will of that year commits his soul to ‘the hands of Almighty God my Maker and Redeemer by the Meritts of whose death and passion by mercy through faith I trust to be saved’ and his body to be buried in Newchurch in Rossendale. Half his monetary estate was to be divided between son Richard and daughter Dorothy. The other half was split between 12 friends and acquaintances in small amounts. A fourth part of his land was to his elder son William ‘which went out of England long since if hee be lyvinge and Returned agayne into England’ within 3 years of his decease. Easily the most interesting was a further bequest to ‘John Heaton alis Bridge Twenty shillings in a yeare for the tyme of four yeares after my death And fourty shillings to bind him Prentice to learn some trade if any man will undertake to doe it for him’. Newbigging, History of the Forest of Rossendale 1st end pp 97-107. LDS film 1040340 via the Lancashire OPC. 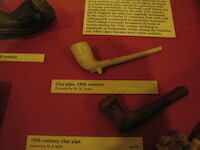 Exhibit in the Whitaker museum, Rawtenstall. 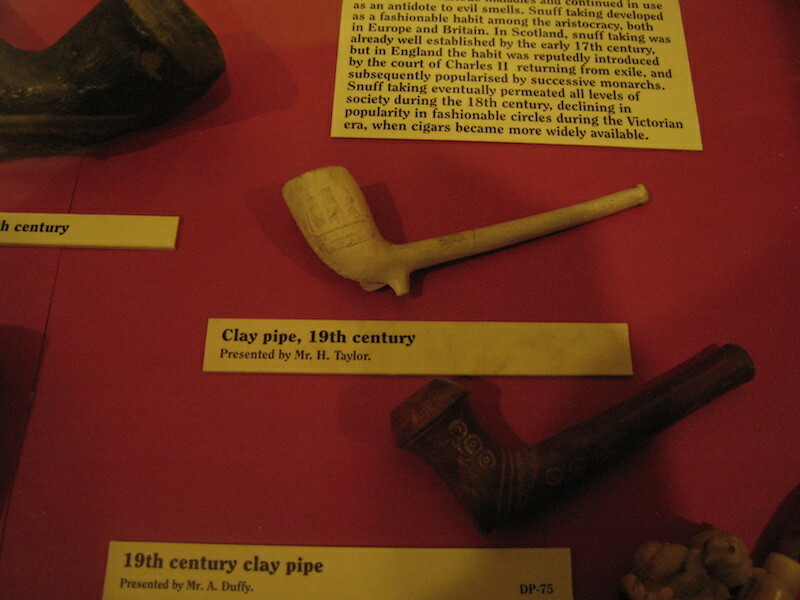 A C19 clay pipe donated by Springhill resident Harry Taylor. how he came to have it or why the museum were interested are unknown. It is Holy Week and it is also the start of the general election campaign. Both of these traditionally involve the displaying of posters announcing the allegiance of the residents. 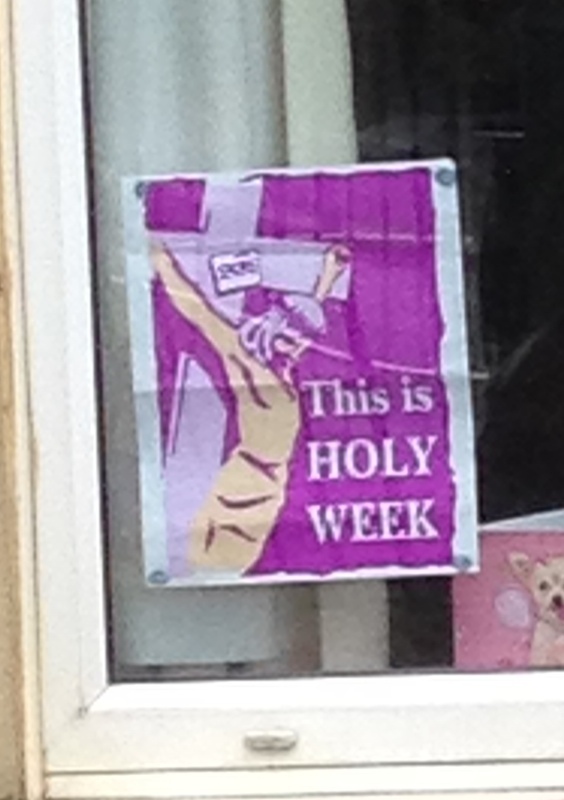 So far Holy Week is winning, with a smattering of HW posters and not a single campaign one yet…watch this space to discover how many trees are voting labour and whether the UKIP candidate even puts one in his window. World War 1 continued its relentless toll. Private, 44257, 1st Bn Loyal North Lancashires, d 2/10/1918 aged 34 (RFP has 36). Commemorated A 46 Senquehart 1. Address 1911 3 Lodge Fold, carter, married, no children. Sadly he died in Oct 1918, just over a month before armistice. Could (or should) that have been different? He was awarded the British War and Victory Medals.He was the son of Charles Harvey (Coal Dealer, of Cross Farm, Dobbin Lane) and his wife Ellen. Lodge Fold, where Thomas lived in 1911, was the farm and barn just south of Springhill. Sections dated from C17 and it it thought to have been the barn in which the dissenting congregation were granted a licence to worship in 1672. This census is the first indication I have come across that the buildings were subdivided.